Figure 10.2. Black holes do not emit any energy or particles, but when a black hole is part of a binary system, gas is drawn from the companion onto an accretion disk that glows in X-rays. The binary orbit gives the mass of the black hole. 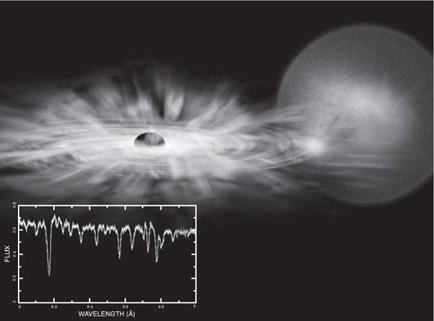 The image is an artist’s impression, while the inset shows an X-ray spectrum which diagno­ses the temperature of the plasma near the black hole and gives clues to the black hole’s properties (NASA/CXC/M. Weiss/J. Miller). 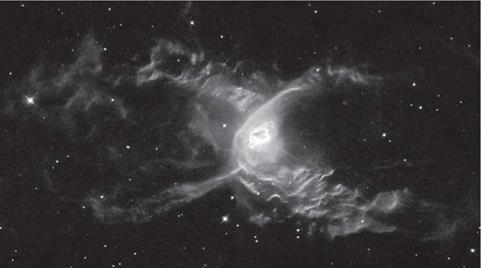 Kessler explains that some astronomers were initially dismissive of Hubble’s “pretty pictures.” They felt such images had less to do with science and that the public would accept the false color pho­tos as what Hubble actually sees. But as Kessler points out, Hubble was the vehicle for changing this perception, particularly in the case of the stunning images of the Eagle Nebula (M16) released in 1995 (plate 20). A group of astronomers at Arizona State Uni­versity led by Jeff Hester were interested in photo-evaporation, by which they suggested radiation from a massive star in the nebula is evaporating gaseous material away from sites of newly forming stars. Kessler notes that Hester’s team “did not plan the observa­tion with the intention of creating a visually impressive picture.”27 However, their remarkable image of the Eagle Nebula awed scien­tists and general audiences alike. And, as anticipated, in the nebu­la’s 10-trillion-kilometer gaseous columns, Hester’s team identified regions of newly forming stars. Upon release of the Eagle Nebula images, Kessler reports, “The New York Times, Washington Post, USA Today, and other major newspapers printed articles featuring the image, and Newsweek, U. S. News and World Report, and Time all ran stories in the fol­lowing weeks.”28 Kessler highlights the fact that while the news reports detailed Hester’s theory regarding new star formation, the real emphasis of the news coverage was the spectacular beauty of the cloud pillars in the Eagle Nebula, subsequently dubbed the “Pillars of Creation.” A report in 1999 on Hubble’s popularity by the Space Telescope Science Institute indicates that “web hits at the time of the M16 release were about a half a million a month.”29 The fascination with Hester’s image of the Eagle Nebula demonstrated that stunning astronomical photos could capture both important scientific data and amazing spacescapes that readily communicate complex information to general audiences. Kessler points out that NASA quickly realized the tremendous public support for Hubble might be better served through an organization that would regu­larly request, produce, and release images taken by Hubble. The Hubble Heritage Project emerged out of such interest. Hubble’s photos easily convey some of the most fascinating as­pects of star birth and death, and solar system formation. In many cases it doesn’t require specialized or scientific training to immedi­ately grasp the import of some of Hubble’s most remarkable im­ages. This is true for the Hubble photos of the Eagle Nebula and its collapsing gases in star birth regions, the newly forming star systems in the Orion Nebula (M42) with its proto-planetary disks the size of our Solar System, the star birth visible in the arms of the Whirlpool galaxy as illustrated in the mosaic of M51 (figure 11.2), or the bizarre and complex cloud formations produced by dying stars at the heart of planetary nebulae. Figure 11.2. 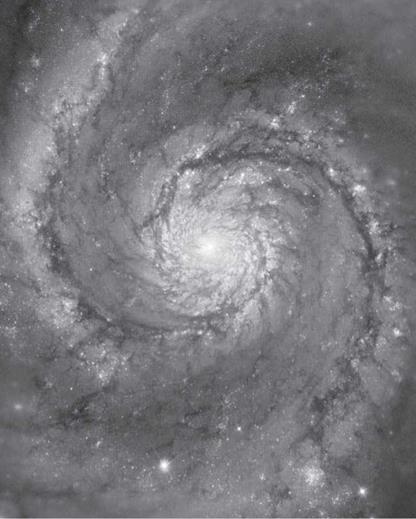 M51 is a nearby spiral galaxy called the Whirlpool galaxy; this is how the disk of the Milky Way would appear if we could gaze down on it, rather than being embedded in the disk. A nearby companion galaxy is triggering intense star formation in the spiral arms. Hubble Space Telescope can resolve individual bright stars in this galaxy (NASA/STScI/Hubble Heritage Team). Figure 11.3. The Red Spider Nebula (NGC 6537) has waves of dust and gas extending a hundred billion kilometers. First cataloged by William Herschel over two hundred years ago, the subtle patterns are due to shock waves caused as outflowing material runs into the interstellar medium, a gas more sparse than the best vacuum on Earth (NASA/ESA/STScl/G. Mellema). kilometers, or 6 trillion miles, or explaining that stellar winds in the Red Spider Nebula (NGC 6537) produce waves of dust and gas a hundred billion kilometers high (figure 11.3), while nearly incom­prehensible, has afforded general audiences unprecedented under­standing of the incredible energy and matter involved in star birth and death.34 Hubble images of gravitational lensing caused by large clusters of galaxies, majestic barred spirals whirling through space, and spectacular globular clusters have been indelibly etched into the public imagination. But beyond this popular appeal, the Hubble Space Telescope has generated enough unique data to qualify as the most successful scientific experiment in history. Scientific discovery rarely unfolds smoothly or predictably. Eight years before the theoretical prediction of relic radiation, Andrew McKellar measured the spectra of stars and discovered interstel­lar material that was excited to a temperature of 2.3 K.17 He had no explanation for the excitation, which is caused by the radia­tion from the big bang.18 While Gamow’s prediction of a universe bathed in cold, microwave radiation sat in the literature, several experimenters had the detection of the radiation within their grasp but either did not control systematic errors well enough or were not aware of the importance of the observation. Robert Dicke at Princeton was, and by 1964 he and his team were hot on the trail of the big bang signature. But as they were preparing a radiometer on the roof of the physics building they got a call from Bell Labs. “Boys, we’ve been scooped,” was Dicke’s memorable response.19 The Nobel Prize was awarded in 1978 to Arno Penzias and Robert Wilson of Bell Labs for their discovery. universe to its very early epochs. The Hubble expansion is a lin­ear relationship between distance and recession velocity: more dis­tant galaxies are moving away from us quicker. Although at first glance this seems to imply that we have a privileged location in the universe, a hypothetical observer in another galaxy would see exactly the same relationship that Hubble saw. In a uniform three­dimensional expansion each observer thinks they are the center of the universe. Since all cannot be, none are. Nor can we see an edge to the universe, so we can’t place ourselves with respect to a boundary. The Copernican principle holds. There’s no discernable center to the universe. Extrapolating further backward, there was a time when the uni­verse was much denser than it is now and hot enough that atoms were ionized. Electrons liberated from atomic nuclei interacted with radiation and stopped the photons from traveling freely. It was as if the universe was shrouded in an impenetrable fog. As the universe expanded and thinned out and cooled, it became trans­parent and radiation could travel without interruption. This spe­cial epoch is the earliest time we can “see” into the universe. In a big bang model, the background radiation comes from a time when the universe was a thousand times smaller than it is today, and a thousand times hotter. Infrared photons from 380,000 years after the big bang, when the temperature was about 3000 K, have been stretched a thousand-fold to become microwave photons in a vast and frigid universe with a temperature a little below 3 K.
The picture of the sky in microwaves is an extraordinary baby picture of the universe. Imagine as an adult that you were shown a picture of yourself a few hours old. Since those waves are from the universe as a whole, they permeate space and they travel in every direction through expanding space. There are trillions of relic photons from the big bang in any volume like that of one breath. However, their radiant intensity coming from any direction in space is only 0.00001 Watt or a ten-millionth of a light bulb.21 If you can find an old-fashioned image tube TV and tune it between stations so you see only static, about 1 percent of the white specks on the screen are interactions of the dots of phosphor with those microwaves.22 The big bang is all around us. The formation of a black hole is just one half of the story when a massive star dies. As the star reaches the end of its life and all fusion energy sources are exhausted, it suffers a dramatic gravita­tional collapse. The crushing force of in-falling gas squeezes the core into a black hole, but much of the mass rebounds outward and the outflowing gas meets more in-falling gas and heats it mo­mentarily to billions of degrees. Heavy elements like gold and sil­ver and platinum are created in that thermonuclear blast and they surf into space to become part of future generations of stars.34 This is a supernova. For centuries and millennia after the supernova event, outrush – ing gas interacts with the interstellar medium to form a delicate filigree of nebulosity and filaments of glowing gas. 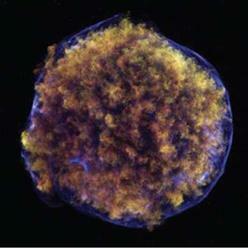 Supernova remnants are most clearly seen in X-rays, and with Chandra their structure can be studied in great detail. The spectrometers on Chandra have mapped the ejection of iron and silicon and oxygen and nitrogen, elements essential for planet-building and for life.35 Cosmic alchemy is part of our story since every carbon and oxy­gen atom in every person was once part of a previous generation of stars. The imagers on Chandra have observed the shock-heated filaments in enough detail to model the process that accelerates particles to within a fraction of a percent of the speed of light (plate 18). What is the science yield from this premier facility, and how has it changed our view of the universe? In the early years of a space telescope, there’s often a concerted effort to put a lot of time into a few critical projects, so that major results will be obtained even if the telescope fails. There’s understandable tension involved in this decision, since the Hubble has always been oversubscribed by a large factor, and it keeps more astronomers happy if the time is thinly spread among many projects. Riccardo Giacconi, the first director of the Space Telescope Science Institute, was persuaded to set aside substantial time for peer-reviewed “Key Projects.” Early in the history of the facility, three of these were approved. Two of them were successful but are not well known—a medium – deep survey of galaxies,35 and a spectroscopic survey of quasars to probe the hot and diffuse gas in the intergalactic medium36—but the third is rightly considered one of the Hubble Space Telescope’s finest achievements. As we saw in the chapter on Hipparcos, distance is fundamental to astronomy, yet it’s one of the hardest things to measure. In the everyday world we judge distance based on familiarity with the size of a tree or a person, for example, or the brightness of a lamp or a street light. But in the universe, objects like stars and galax­ies range over many orders of magnitude in size and brightness, so their apparent size or brightness is a very unreliable guide to distance. Is that a bright object far away or a dim object nearby? Is that a large object far away or a small object close by? This type of confusion is common. Considered in a different way, poorly deter­mined distances limit our knowledge of how the universe works. Without knowing how far away an object is, we don’t know its true size or its true brightness. That also means we don’t know its mass or luminosity, which means we can’t have a real physical un­derstanding of something that’s so remote that we’ll never be able to study it in the lab or gather a sample of it. This urge to measure distances accurately becomes acute in the study of the universe as one entity. In an expanding universe, precise distances are needed to answer fundamental questions: what is the size of the universe and how old is it? Early in the life of the Hubble telescope, hundreds of orbits were devoted to measuring distances to three dozen galaxies. Fittingly, this Key Project used the method that Edwin Hubble had used in the early 1920s to show that the Andromeda nebula was a remote stellar system. Hubble identified examples of a well-known class of variable stars in M31, the Cepheid variables. Cepheids pulsate in a well-understood and well-regulated way, and this behavior mani­fests as a linear relationship between their luminosity and their period of variation.37 By finding Cepheids in a remote galaxy and measuring their periods with a series of images taken over hun­dreds of days, the star’s absolute and apparent brightness can be combined to derive the distance. Cepheids are very luminous and can be seen to large distances. But they’re buried in dense regions of overlapping star images so the sharp imaging of a telescope in space is needed to pick them out. Wendy Freedman, Rob Ken – nicutt, and Jeremy Mould led the project, accompanied by twenty – five other astronomers from around the world. The Key Project had a goal of measuring the distance scale to an accuracy of 10 percent. This might seem unduly modest, but it’s a reflection of the difficulty of the experiment. In the decade leading up to the launch of Hubble, astronomers had disagreed by 50 percent or more on the distance scale. In particular, the goal was to measure a quantity called the Hubble constant to within 10 percent. The Hubble constant is the current expansion rate of the universe, measured in units of kilometers per second per Megapar­sec. Hubble discovered a linear relation between the distance and the recession velocity of a galaxy. The Hubble constant sets that scaling. So if the Hubble constant is 70, then for every Megaparsec (3.3 million light-years) increase in distance, the recession velocity increases by 70 kilometers per second (157,000 mph). On average, this scaling says that a galaxy a million light-years away is reced­ing from the Milky Way at 47,000 mph, a galaxy 10 million light – years away is receding at 470,000 mph, and so on. Inverting the Hubble constant allows us to project the expansion back to zero separation of all galaxies, and so gives us a good estimate of the age of the universe. By measuring distances out to 20 Megaparsecs (or 66 million light-years), the Key Project would determine the size, expansion rate, and age of the universe. The formal result of the Key Project was the measurement of a current expansion rate of 73 kilometers per second per Megapar­sec, with a random error of 6 and a systematic error of 8, published in the twenty-eighth paper in the series from team members, which indicates just how productive and prolific one Hubble project can be.38 Synching the distance scale in this way has been a foundation stone in the emergence of “precision cosmology,” where overall attributes of the universe are becoming very well-determined. Al­though the Key Project worked in our cosmic “back yard,” or the local 0.01 percent of the visible universe, it leveraged and helped to improve distance measurements both inward and outward. Hub­ble also was able to measure parallaxes for Cepheids in the Milky Way (along with Hipparcos, which we’ve previously discussed) and tether the distance scale in direct geometric measures. Know­ing Cepheid distances for several dozen galaxies calibrated the use of other types of distance indicators, such as supernovae and the well-defined rotation properties of galaxies, which can be used out into the remote universe. At least forty to sixty different types of eyes, with up to ten dis­tinct means of forming images, have independently evolved, from simple constructions like a patch of skin acting as a photorecep­tor, to the compound eyes of flies and spiders, to the sophisticated eyes of the hawk or squid. “The result is an enormous range of eye types using pin-holes, lenses, mirrors, and scanning devices in various combinations to acquire information about the surround­ing world,” write Land and Nilsson. “Not all eyes are paired and placed on the head: there are chitons with eyes spread over their dorsal shell, tube worms with eyes on their feeding tentacles and clams with eyes on the mantle edge.”37 Various cave-dwelling ani­mals, because of a lack of light, have evolved without eyes. Some lizards, frogs, and fish, though they have complex eyes, also sport at the top or back of the head a third eye, or parietal eye, that at the least can indicate the presence or absence of light caused by the passing of a predator’s shadow. Even such a rudimentary eye offers valuable survival information. At the other end of the spectrum of eye development are box jellyfish that have twenty – four eyes of four different types, two of which are extremely similar to human eyes. Existing for 600­700 million years, jellyfish have survived five mass extinctions but they’re often incorrectly characterized as not having a brain. Re­searchers recently found that neurons in jellies occur in neuronal centers distributed throughout their bodies and that they purpose­fully navigate within their environment. Box jellyfish use the acute vision of their pseudo-human eyes to see under and above water in navigating to and from underwater mangroves in order to feed, as a story in the New York Times reports: “Not only are the eyes equipped with a cornea, lens and retina, as human eyes are, but they are also suspended on stalks with heavy crystals on one end, a gyroscopelike arrangement that ensures the eyes are focused un­erringly skyward. . . . Every morning they must return to the roots or risk starvation. They rise toward the surface and their upturned eyes scan the sky, until at last they spy the mangrove canopy.”38 Beyond even these complex eyes are those of the cephalopods, like the octopus or squid, believed to be the most sophisticated eyes on the planet. Cephalopods focus their eyes with fine movements of the lens, unlike vertebrates, and they can automatically keep their pupils horizontal and even sense the polarization of light. By the early 1970s, theorists had predicted that the microwave radiation should not be perfectly smooth. That’s because a slightly uneven distribution of matter causes very small variations in tem­perature, with denser regions hotter. The subtle variations in den­sity act as the seeds for later structure formation. Theories of gal­axy formation could not generate large lumps of matter without a little lumpiness with which to start. The initial variations are not really like “lumps” since they are physically extremely large and extremely shallow. In a purely metaphorical sense, the mighty oak trees that are present-day galaxies grew from the tiny acorns of anisotropy in the background radiation. NASA’s Cosmic Background Explorer (COBE) was launched in 1989 to make more precise measurements of the microwave radia­tion than could be made from the ground or from high altitude bal­loons. COBE was cheap by modern standards, about $150 million, and extraordinarily successful. It confirmed the exquisite thermal nature of the spectrum, ruling out the last few remaining potential explanations other than a big bang. With only four years of data, the satellite was able to detect minute variations from smoothness; the radiation deviated from a constant temperature from one part of the sky to another by one part in a hundred thousand.24 These were the long-sought seeds of structure formation. Commentators and media pundits breathlessly embraced the story when project leader George Smoot talked about having discovered the “finger­prints of God.”25 Smoot and his colleague John Mather shared the 2006 Nobel Prize in Physics for their heroic work in advancing cosmology with the detection of these tiny fluctuations. But there’s an extraordinary twist to this story. The smooth­ness of the microwaves and their perfectly thermal spectrum are difficult to explain in the standard big bang model because the universe was expanding so quickly early on. At the time the micro­waves were released, two points in space were receding at nearly sixty times the speed of light. Under these conditions, there’s no way disparate parts of the universe could come into equilibrium so adjacent patches of the sky shouldn’t be at exactly the same tem – perature.26 A related puzzle is the near-flatness of space. General relativity is based on curved space-time and it was expected that the vast mass of the universe would give an imprint of curvature. The cosmic background microwaves have traveled across the en­tire universe so should reveal if the space they’ve traveled through is curved. It’s not. To explain the smoothness of the radiation and the flatness of space, cosmologists have hypothesized a fantasti­cally early time, only 10-35 seconds after the big bang, when the en­tire universe expanded exponentially due to physics involved with the unification of three fundamental forces of nature. This event is called inflation. Inflation modifies the big bang theory by positing that all we can see to the limit of vision of our telescopes—called the observ­able universe—is a small bubble of space-time that inflated to be­come large, smooth, and flat. The totality of space-t ime is very much larger, perhaps infinitely larger. Moreover, the variations in radiation that will grow to become galaxies are quantum fluctua­tions from a tiny fraction of a second after the big bang.27 It’s an extraordinary hypothesis. In 1964, Riccardo Giacconi and his team discovered Cygnus X-1, a source in the constellation known as the Swan that is generally accepted as the first black hole detected. Cygnus X-1 has a mass nine times that of the Sun, with an implied event horizon size of 16 miles, smaller than a city. But in the early 1960s, X-ray astronomy was an emerging science,39 and a singularity was then considered purely theoretical. In 1939, J. Robert Oppenheimer, who would later be a leader in the Manhattan Project, and a student, Hartland Snyder, suggested that Einstein’s equations had made an apocalyptic prediction. A dead star of sufficient mass could collapse into a heap so dense that light could not even escape from it. The star would collapse forever while space­time wrapped around it like a dark cloak. At the center, space would be infinitely curved and matter infinitely dense, an apparent absurdity known as a singularity. Dr. Wheeler at first resisted this conclusion, leading to a confron­tation with Dr. Oppenheimer at a conference in Belgium in 1958, in which Dr. Wheeler said that the collapse theory “does not give an ac­ceptable answer” to the fate of matter in such a star. The star that would not die All who dare To cross her course Are swallowed by A fearsome force. . . .
Gains control. . . . Figure 11.4. Although the Hubble Space Telescope is relatively small by modern standards, its sharp imaging and sensitive instruments allow it to see supernovas at distances of billions of light-years. When they die, these stars rival the bright­ness of their surrounding galaxies, enabling the distances to those galaxies to be measured (NASA/STScI/P. Garnavich). 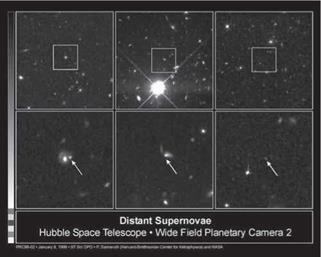 us and a supernova relative to constant expansion, making it ap­pear brighter. Instead, they saw the opposite effect: the distant su­pernovae were dimmer than expected. The interpretation was the distance to the dying star was larger than expected. Rather than decelerating, the universe has been accelerating! Cosmic accelera­tion is a very puzzling effect, because it implies a force acting in op­position to gravity. No such force is known in physics, so the cause of the phenomenon was called “dark energy,” where that phrase is really just a placeholder for ignorance. Dark energy seems to have the character of the cosmological constant, the term that Ein­stein added to the solutions of his equations of general relativity to suppress natural expansion (and which he later called the greatest blunder of his life). It’s new and fundamental physics. The discovery of cosmic acceleration was based on images and spectra taken with ground-based telescopes. The Hubble Space Telescope didn’t make the initial discovery. But confirming the re­sult, extending the measurements to higher redshift, and putting constraints on the nature of dark energy—all of those have been essential contributions. Hubble’s depth has been used to trace the expansion history back over two thirds of the age of the universe. The data show that acceleration reverts to deceleration more than 5 billion years ago.41 Astronomers can now apportion the two major components of the universe: dark matter and dark energy. Dark energy accounts for 68 percent, dark matter accounts for 27 percent, diffuse and hot gas in intergalactic space is about 4.5 percent, and all the stars in all of the galaxies in the observable uni­verse amount to only 0.4 percent of the cosmic “pie.” Dark forces govern the universe. Imagine the expanding universe with a brake and an accelerator. The “driver” isn’t very competent so they press both pedals at the same time. Dark matter is the brake because gravity slows the ex­pansion. Dark energy is the accelerator. In the first two thirds of the expansion history, the dark matter dominates and the expansion slows with time. But the effect of dark matter weakens, because the density and the gravity force go down, while dark energy has a constant strength in both time and space. So the pressure on the brake eases while the accelerator is pressed the same amount, and about 5 billion years ago all galaxies started to separate at ever – increasing rates. Some cosmologists consider it an unexplained coincidence that dark energy and dark matter—two mysterious entities with fundamentally different behavior—happen to have roughly the same strength and crossed paths relatively recently in cosmic time. This is the only time in cosmic history they are close to equal strength; for most of the early history of the universe, dark matter was utterly dominant and forever into the future dark energy will dominate. This coincidence only sharpens the enigma. Although the deep sea is one place sunlight cannot reach, light and vision are no less critical there than for landlocked creatures. The Spookfish, for instance, lives at 1,000 meters’ depth in cold, dark Pacific Ocean waters and has reflective telescopes for eyes.41 Spookfish weren’t exactly the first astronomers, but unlike any other vertebrates, their eyes include crystal mirrors that focus light on the retina. And some marine animals have evolved the equiva­lent of wearing Polaroid sunglasses—they can see polarized light, which assists in their discerning jellyfish and other nearly transpar­ent species moving through the water column. Deep below the coral reefs, ocean animals produce their own light to see and lure prey, signal distress or otherwise communi­cate, attract a mate, repel and stun predators, and counter-shade themselves.42 Nouvian contends that bioluminescence is the most common mode of communication on the planet. Approximately 90 percent of all ocean animals produce or deploy biolumines­cence in some capacity. Also referred to as cold body radiation or “cold light,” nearly 98 percent of the energy used in generating this living light affords only a minimal release of heat, presumably to protect the luminescent organism from being detected by preda­tors who sense infrared. Plate 1. More than a century after Per – cival Lowell mapped Mars, the Hubble Space Telescope turned its best camera onto the red planet, producing this true color image in March 1997, just after the last day of Martian spring in the northern hemisphere. Mars was near its closest approach to Earth, 60 million kilome­ters away (NASA/David Crisp and the WFPC2 Camera Team). Plate 2. Mars as seen by the Viking 2 lander. 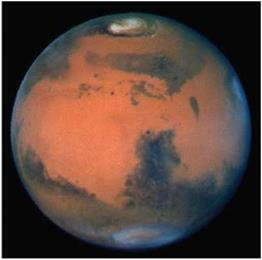 Images like this dashed the more fevered speculation of Mars as a living planet stemming from Percival Lowell and subsequent science fiction; it was revealed as a frigid and arid desert with a tenuous atmosphere, where water cannot exist for more than a moment on the surface before evaporating (NASA/Mary Dale – Bannister, Washington University in St. Louis). Plate 3. Artist’s conception of one of the Mars Exploration Rovers on Mars. 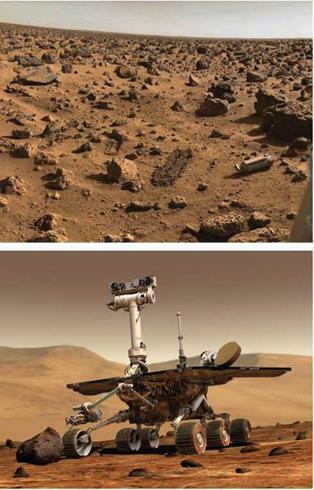 Spirit and Opportunity each far exceeded their life expectancy and have performed at a very high level in the unforgiving conditions on the surface of Mars. The rovers were identical as pieces of hardware, yet had quite dif­ferent experiences and adven­tures. Opportunity has exceeded its design lifetime by a factor of more than 35 (NASA/Jet Propulsion Laboratory). Plate 4. Victoria Crater at Meridiani Planum on Mars, which is about 730 meters in diameter. Opportunity spent over two years exploring the rim of the crater, occasionally venturing inside, and by mid-2011 had traveled over 20 miles across the Martian terrain. Opportunity had a lucky bounce on landing and extricated itself from the kind of sand dune that disabled Spirit (NASA/Jet Propulsion Laboratory). Plate 5. The four Galilean moons of Jupiter, visited by the Voyager spacecraft in 1979. In decreasing size order, the moons are Ganymede, Callisto, Io, and Europa; Jupiter is not shown at the same scale. Ganymede is 5300 km in diameter. 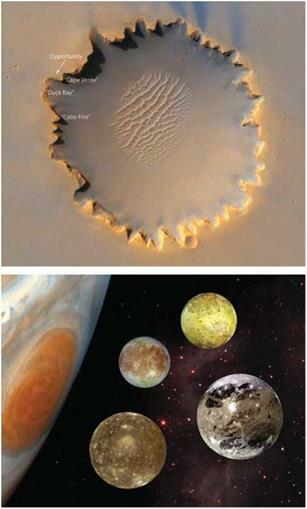 The spacecraft made many discoveries in the Jovian moon system, including volcanism on Io and a subsurface ocean on Europa (NASA Planetary Photojournal). Plate 6. 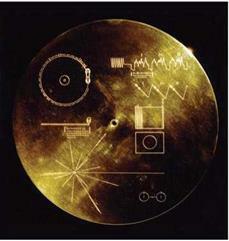 Attached to the body of each Voyager spacecraft is a gold-plated, copper phonograph record. The record contains musical selections, images, and audio greetings in many world languages, along with instructions on how to retrieve the information. The analog technology will be very durable in the far reaches of space (NASA/Jet Propulsion Laboratory). Plate 7. An artist’s impression of a close-up view of Saturn’s rings. The rings are thought to be made of material unable to form a moon because of Saturn’s tidal forces, or to be debris from a moon that broke up due to tidal forces. The particles are made of ice and rock and range in size from less than a millimeter to tens of meters across (NASA/ Marshall Image Exchange). Plate 8. A panoramic view of Saturn’s moon Titan, from the Huygens lander during its descent to the surface in late 2005. In this fish-eye view from an altitude of three miles, a dark, sandy basin is surrounded by pale colored hills and a surface laced with stream beds and shallow bodies of liquid composed of methane and ethane (NASA/ESA/Descent Imager Team). Plate 9. Stardust collected samples of a comet and interstellar dust samples using a particle collector with cells containing aerogel, which is an amorphous, silica-based material that is strong yet exceptionally light. Particles entered this solid foam at high speed and were decelerated and trapped. The spacecraft returned its samples to Earth in 2006 (NASA/Jet Propulsion Laboratory). Plate 10. This composite image was taken of comet Wild 2 by Stardust during its close approach in early 2004. The comet is about 3 miles in diameter. Its surface is intensely active, with jets of gas and dust spewing millions of miles into space. This image is a hybrid: a short exposure captures the jet while a long exposure captures the surface features (NASA/Jet Propulsion Laboratory). Plate 11. SOHO took this image of the Sun in January 2000. The relatively placid optical appearance belies the intense activity seen in this ultraviolet image, where a huge, twisting prominence has escaped the Sun’s surface. When these events are pointed at the Earth, telecommunications and power grids can be affected (NASA/SOHO). Plate 12. This computer representation shows one of millions of modes of sound wave oscillations of the Sun, where receding regions are colored red and approaching regions are colored blue. The Sun “rings” like a bell, with many complex harmonics, and study of the surface motions can be used to diagnose the interior regions (NSO/AURA/NSF). Plate 13. People have used the sky as a map, a clock, a calendar, and as a cultural and spiritual backdrop since antiquity. 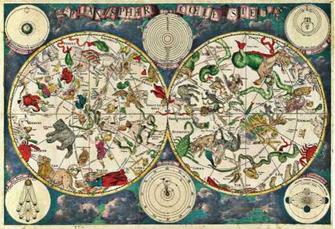 This celestial map was produced in the seventeenth century by the Dutch cartographer Frederick de Wit. Constellations and star patterns are unchanging from generation to generation, so the stars were seen as being eternal (Wikimedia Commons/ Frederick de Wit). Plate 14. We live in a city of stars, seen here in a full-sky panorama of the Milky Way photographed from Death Valley in California. The ragged band of light represents a view through the disk of the spiral galaxy we inhabit, and Hipparcos has mapped out the nearby regions of the disk and parts of the extended halo (U. S. National Park Service/Dan Duriscoe). Plate 15. This Spitzer Space Telescope image shows star formation around the Omega Nebula, M17. This Messier object is a nebulosity around an open cluster of three dozen hot, young stars, about 5,000 light-years away. 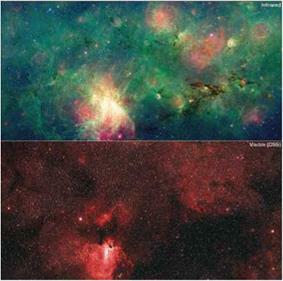 Spitzer records information at invisibly long wavelengths, and the difference between the view in the infrared (top) and the optical (bottom) can be dramatic. Colors in the infrared view represent different temperature regimes, with red coolest and blue hottest (NASA/JPL – Caltech/M. Povich). Plate 16. 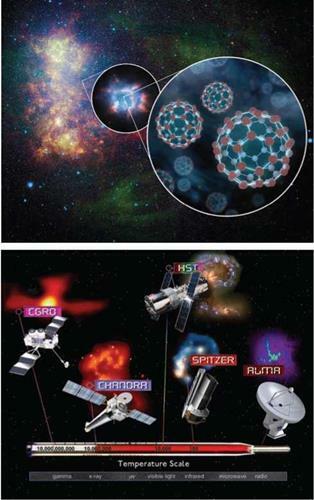 The Spitzer Space Telescope detected molecules of buckminsterfullerene, or “buckyballs,” in a nearby galaxy, the Small Magellanic Cloud. The first zoom shows the type of planetary nebula where the molecules were found, and the second shows the molecule structure, where sixty carbon atoms are arranged like a tiny soccer ball (NASA/SSC/Kris Sellgren). Plate 17. NASA’s Great Observatories are multi-billion – dollar missions with complex instrument suites, designed to answer fundamental questions in all areas of astrophysics. Including the ground-based Atacama Large Millimeter Array (ALMA), they can diag­nose the universe at temper­atures ranging from tens to tens of billions of Kelvin (NASA/ CXC/M. Weiss). Plate 18. The dying star that produced this great bubble of hot glowing gas was first noted by Tycho Brahe in 1572. A white dwarf detonated as a supernova when mass falling in from a companion triggered its collapse; the shock wave from the subse­quent explosion led to the blue arc. The surrounding material is iron-rich and highly excited iron atoms create spectral lines detectable at X-ray wavelengths (NASA/ CXC/Chinese Academy of Sciences/F. Lu). Plate 19. 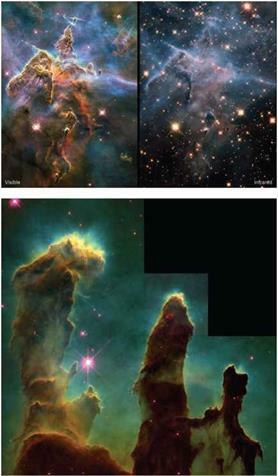 Two images of a pillar of star birth, three light-years high, in the Carina nebula, about 7,500 light-years away. Images taken through different filters select different wavelength ranges, which are combined into “true color” composites, where the colors convey astrophysical information in either visible light or infrared waves. Images like this have turned nebulae, galaxies, and clusters into “places” that resonate in the popular imagination (NASA/ESA/ STScI/M. Livio). Plate 20. This image of the towering gas columns and bright knots of young stars seen in the Eagle Nebula (M16) was probably the first Hubble Space Telescope image to achieve widespread public recognition. It was part of the inspiration for the Hubble Heritage project, which showcases a different high-impact color image on the web each month. New worlds are being born at the tips of these fingers of hot gas (NASA/ESA/STScI/J. Hester/P. Scowen). Plate 21. This exquisitely accurate map of the microwave sky, a projection of the celestial sphere onto a plane, shows the universe when it was a tiny fraction of its present age. The temperature variation between red and blue “speckles” is about a hundredth of a percent. The tiny variations, on angular scales of about a degree, represent the seeds for galaxy formation. It took a hundred million years or so for gravity to form the first galaxies (NASA/WMAP Science Team). Plate 22. 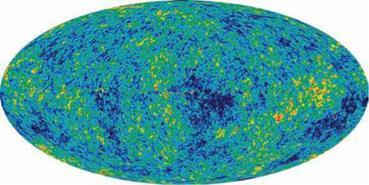 WMAP has played a major role in pushing the big bang model to the limit. The current model of the expanding universe posits an early epoch of inflation or exponential expansion, and subsequent expansion governed in turn by dark matter, causing deceleration, and more recently, dark energy, which is causing acceleration. WMAP has ushered in an era of “precision” cosmology (NASA/WMAP Science Team). Plate 23. The Mars Science Laboratory, named Curiosity, will be exploring Mars for at least two years, starting with its landing in August 2012. The rover is the size of an SUV, compared to the Mars Exploration Rovers, which are the size of a golf cart, and the earlier Pathfinder, which is the size of a go – kart. Curiosity will study the past and present habitability of Mars by a detailed geochemical analysis of its rocks and atmosphere (NASA/ JPL-Caltech). Plate 24. This montage of 1,235 exoplanet candidates from Kepler shows the planets projected against their parent stars, giving an idea of how they are detected by the slight dimming of the star’s light. By the end of its mission, Kepler will have collected enough data to be sensitive to Earth-like planets in Earth-like orbits of their stars, many of which are expected to be habitable (NASA/ Kepler Science Team). predator in turn visible to fish looking for a quick meal. Medical researchers are only beginning to realize what we might learn from deep-sea bioluminaries. Off Puget Sound in the Pacific Northwest live the Aequorea victoria jellyfish, from which Green Fluorescent Protein (GFP) was first derived and used to generate other fluo­rescing marker proteins crucial in cancer and brain research and invaluable to cell biology and genetic engineering.46 What zoolo­gists discover about the variety of species deploying biolumines­cence in the deep ocean can help astrobiologists anticipate the life – forms that might illuminate the icy oceans of Europa, or alien seas on exoplanets orbiting other stars. To that end, Spitzer and other telescopes nightly scour the skies in search of other worlds.